For the record, if you want or need to do professional-grade editing work on your photos, there's nothing better than Adobe Lightroom and Photoshop. 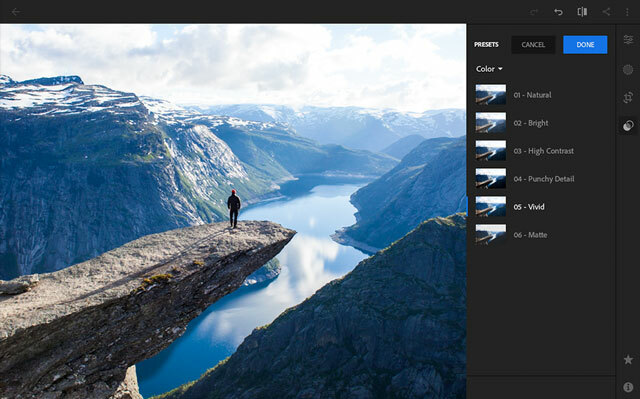 Lightroom not only has a fantastic image cataloging system, it also allows for more control and flexibility when making edits and doing fine-tuning. Photoshop, on the other hand, allows for more precise photo altering. That said, smartphones are becoming more and more powerful — alarmingly, even — and photo editing apps are getting better at providing users with specific functions they might need for quick editing on the go. 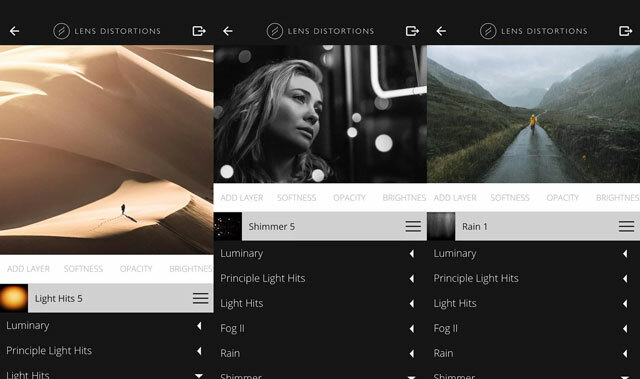 These apps have gone from offering preset filters you can simply slap on to any photo to providing basic and intermediate tools for photo editing. They've become so effective, in fact, that many photographers, Instagram influencers and bloggers swear by them for making quick and easy photo fixes. And since each app has its own expertise or set of special skills, their devotees usually use a combination of two to three different apps for their mobile photo editing needs — much the way they use both Lightroom and Photoshop for different things. 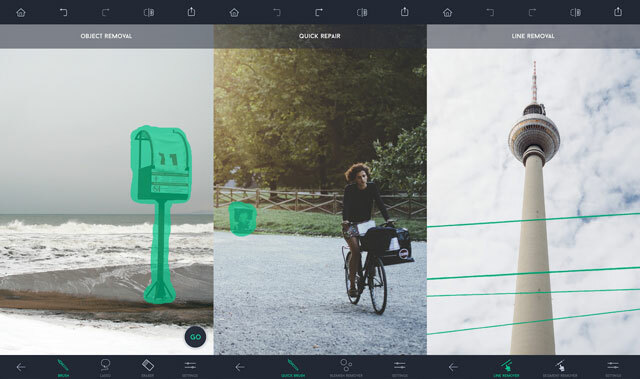 Here are seven of the top photo editing and sharing apps they wouldn't be caught without. 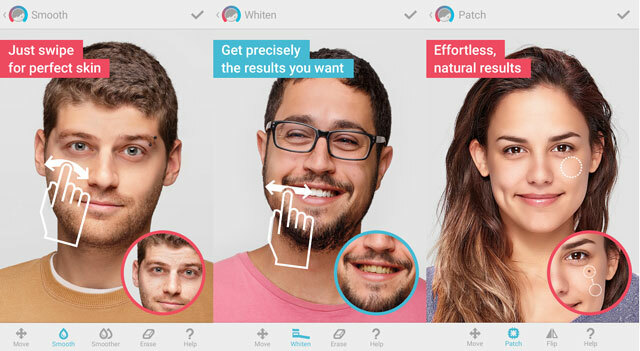 FaceTune might be a bit of a controversial app as its focus is on retouching and many users tend to go over the top with the smoothing tool, giving themselves or their subjects glowing doll faces. However, when used properly, the app is a very effective tool for more professional-looking photos. You can use it to remove blemishes, dirt marks and unappealing highlights, whiten the whites, defocus an area, add light reflections in eyes, and adjust body shapes that may have been caused by the angle or the way the subject is posing. Those are just the beginning. Other tools include lighting and contrast adjustment, color temperature and saturation control, color filters, frames and artistic effects. It's pretty much like Photoshop. Some advanced features, including and content are only available on a recurring monthly, bi-monthly or annual subscription. However, most of the important tools are on hand for free. TouchRetouch is one of those apps you didn't think you needed until you found yourself editing a great shot that might have been perfect had it not been for that electrical line running across the foreground or that random stranger hanging out in the background. One rule in photography is to exclude unnecessary elements, but it isn't always possible. That's where this app comes in, letting you remove those elements — whether there's a garbage bin ruining a landscape shot or a photo-bomber messing up the perfect selfie. The app's big secret? Its patch, clone and healing tools. They're not necessarily unique to this app; Facetune has a patch tool while Snapseed has the healing one. But TouchRetouch makes the whole normally tedious process easy as pie by letting you brush or draw a lasso over the offending element, which the app automatically removes and patches over. And you can do a similar trick with unwanted lines: When it automatically detects one it'll edit only that spot to preserve as much of the photo as possible. TouchRetouch will definitely save you a lot of time and effort. What started as a simple photo sharing and editing tool that offered a small collection of filters and very basic functions has evolved into an advanced app with a massive treasure chest of filters — many with retro, vintage-like effects — and a small repository of editing tools like brightening, changing contrast, sharpening, adding vignette and fading. Admittedly, many of VSCO's competitors offer the same capabilities. However, this app still comes out on top because of its excellent presets that add obvious yet restrained, non-obnoxious edits to the photos. Users usually take advantage of both the presets and the editing tools, adding a filter first and then using the tools to manually tweak each photo to achieve their desired look. Many of the filters emulate the different Agfa, Fuji, Kodak and Instant films as well as popular film processing effects. A yearly subscription gets you access to VSCO's complete collection of over 150 filters. 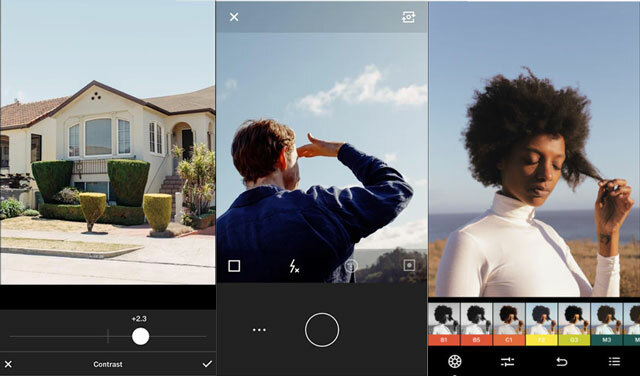 While VSCO has amassed fans for its retro-style filters, Snapseed is lauded for its treasure trove of basic and pro-level editing tools that users can either swipe left and right or select to apply changes. It also boasts special effects and filters that can be applied automatically to photos, though those are not as popular as VSCO's. As far as editing goes, Snapseed is decidedly a better app. It has a more comprehensive menu, from simple options like brightness, ambiance and warmth to pro-level ones like curve and white balance. More importantly, each setting or tool gives users considerably more control. For example, while VSCO can only let you reduce the shadow in a photo, Snapseed lets you decrease as well as increase. And while VSCO only lets you change a photo's tilt (changing the angle from side to side, up or down), Snapseed allows skewing and free transforming. 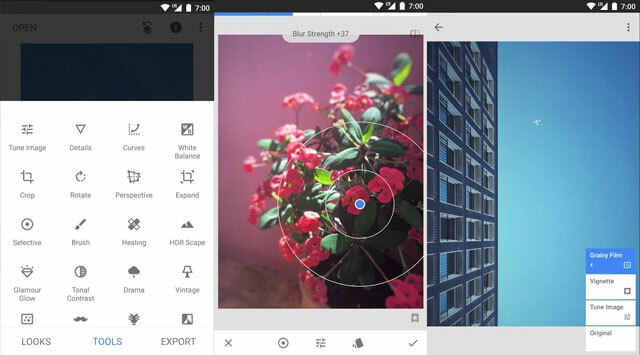 You can work with both apps hand-in-hand, using Snapseed to tune the image and VSCO to add a filter. Is Lightroom's mobile version just as good as its desktop counterpart? Hardly. However, the app is still pretty nifty and boasts quite a set of powerful editing functions and tools. To start, the free version allows you to tweak light, color and detail so you can change basic things like brightness, contrast, temperature, tint and sharpness. It also has some effects like vignetting and haze/fade, automatic lens correction and cropping, and a few presets. What really makes this application special, however, is the fact that, like its older sister, it lets you apply edits or enhancements to specific parts of a photo. This selective adjustment feature gives you more control over your final product. This is one of the premium features, an upgrade that you pay for monthly. Along with this selective adjustment tool, you get 100GB of cloud storage, the ability to edit RAW files, Adobe Sensei (which identifies objects in photos and automatically tags them), and photo sharing. For $5 a month, that's quite a deal. 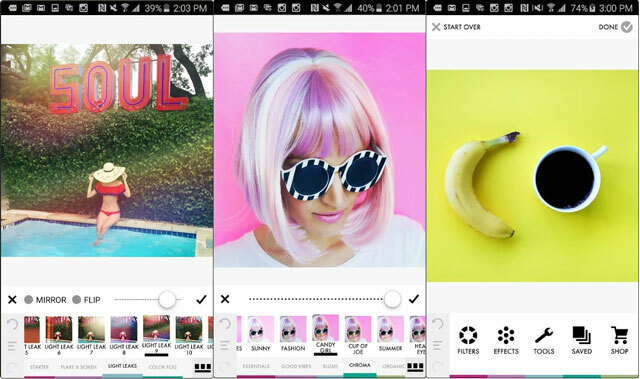 If you adore vibrant colors, then A Color Story might just be the app for you. This charming app is all about enhancing hues and giving photos a fresh, eye-catching look. It's a favorite among bloggers and Instagrammers who love turning their profiles into a lively paint palette of yellows, reds, blues and pinks. The app starts you off with photo cropping, rotating, straightening and perspective adjustments. Because why shouldn't you adjust the frame before you do anything else? Then it lets you apply filters and fun effects, and do some basic adjustments. The filters themselves are designed to enhance colors, add richer finishes and add a particular hue. The whimsical effects include light leaks, color fogs, bokeh (an artistic out-of-focus blur), flares and confetti. One snag is that most filters and effects aren't free. A filter pack will set you back $2.99 while an effect pack will cost around $1.99. But you only need a couple of base packs to get you started. This sophisticated photo editing app might just be one of the most advanced out there, and many creative photo editors and image manipulators adore it. The app lets you add special effects to your images, so it serves more than just your everyday photo editing needs. With Lens Distortions, you can add one or multiple layers of special effects like lights, fog, rain and snow. You can also adjust each effect according to size, angle, softness, opacity, brightness, contrast and saturation. It's a fun app to play with and will work perfectly with landscape and outdoor portraits, but it definitely takes a bit of skill and knowledge — of light refraction and shadows, for example — to make the photos realistic. This is one powerful tool, my friends — you'll get the most out of it once you've mastered the basics. Hey, admin thanks for this tutorial. Sometimes Image size is bigger than expected. But we want to compress an image again you have a thousand ways I personally use imagediamond.com did you try it?